Results from Sydney: extremesailingseries.com/results - In the background Alinghi continues their catracing program, their GC32 scored a win at Sydney and overall for the ESS 2016 Tour. Those short course will surely transform you on a top notch skilled +30' Foiling Catsailor. 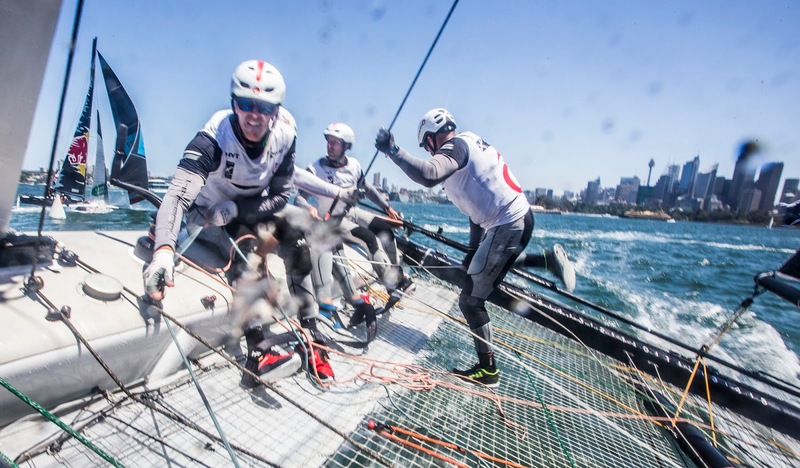 The AC should get rid of grinders, the functional work done by the GC32 teams is unparalleled. and wings don´t add much to the show, of course the AC is all about latest tech etc, but current active controls and else will end in skipper controlling the automatic foilers from the beach. Not a purist but is possible to have the best combo of tough crew work and latest design. The GC32s are a proof of concept. Hope to see Alinghi and more teams challenging next Cup edition. Now that we'll have a Argie team at the GC32 Racing Tour, Red Bull can let Lange helm some ESS stop in 2017? Swiss team Alinghi were crowned 2016 Extreme Sailing Series™ champions today after an epic final-day shoot-out at the season finale in Sydney. In a nail-biting showdown that went right down to the wire, Arnaud Psarofaghis' men saw off a last-ditch attempt from arch rivals Oman Air to complete their ascendancy to the top of the 2016 rankings. 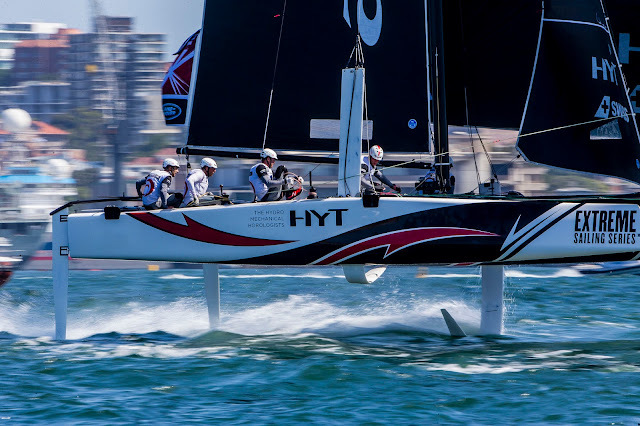 It's the third time Alinghi have won the Extreme Sailing Series following victories in 2008 and 2014 but the first time they've done so 'flying' on the new lightning fast GC32 catamarans. they could defeat Larson's crew they would claim the Series crown for themselves. Alinghi started the final day in charge with a 19-point buffer on Oman Air and opened their scorecards on trademark form with two seconds as Sydney Harbour delivered champagne sailing under bright blue skies and with winds of 13 to 20 knots. However, a wobble halfway through the afternoon gave hope to Oman Air and they answered by notching up a podium finish of their own to narrow the gap once more. Desperate to force Alinghi into making a mistake that could allow them back into contention, Larson pulled out every trick in his book but time and time again the Swiss crew clawed back into the action. Alinghi's season victory was only guaranteed following the 24th and penultimate race of the Act, their fourth place ahead of Oman Air in fifth finally pushing glory beyond Larson's reach. "We're really happy, and pretty relieved too," co-skipper and helmsman Psarofaghis said. "It was a really intense day – we started really well then had a few bad starts. Then we got into a game with Oman Air that we didn't really want to play. 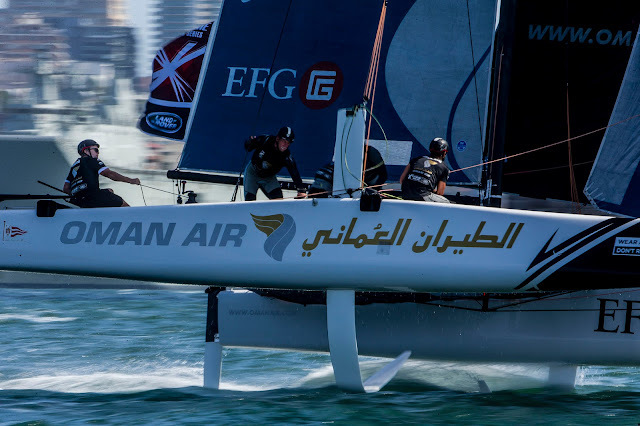 "Halfway through the day Oman Air were still able to come back but then we started to sail simply again. When we sailed our own race away from the pack we were really fast and that was the key for us." Oman Air's dominance over the first half of 2016 saw Alinghi playing catch-up but as the season went on the Swiss crew became known as the kings of consistency, winning just over a quarter of the 169 races held this year and the last four Acts outright. 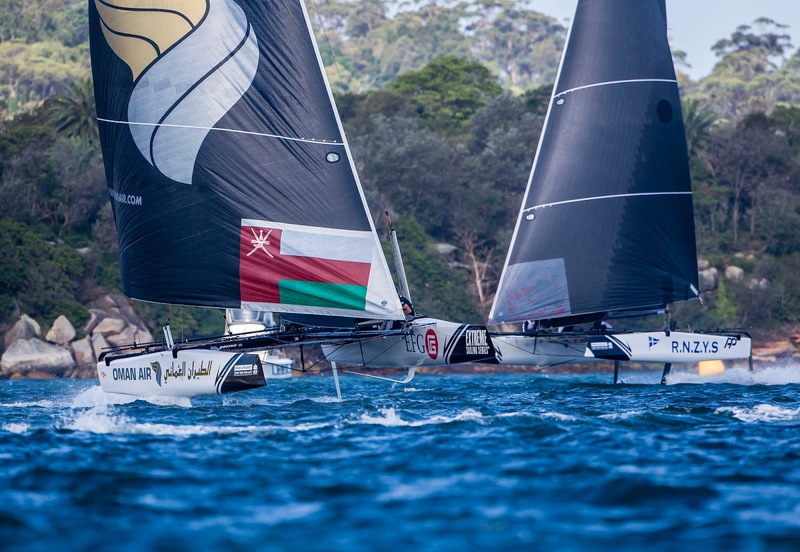 Despite giving it everything Oman Air had to settle for third place in Act 8 behind Danish team SAP Extreme Sailing Team, and second on the overall standings. "It was a great day of sailing but unfortunately we had too big a deficit to make up, and Alinghi were two notches better," said Larson, gracious in defeat. We threw a few things at them and gave them some penalties but they battled back as they do. "We should have come to this event with Alinghi needing to put a couple of boats between us to win, but instead we came in basically tied and it should never have come to that really. But we can't be too disappointed – any time you're on the podium in this event it's a good thing." Red Bull Sailing Team dominated the penultimate day in Sydney but couldn't keep the momentum going, slipping off the Act podium but retaining third place overall. "It was a tough season, this first season on these GC32s," skipper Roman Hagara said, "but it was great to finish on the 2016 podium." 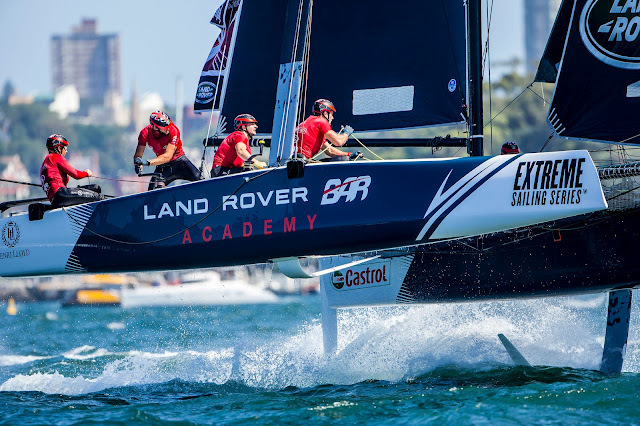 Land Rover BAR Academy recovered from a spectacular capsize on day one and a broken mainsail yesterday to score three podium finishes from eight races today, finishing fifth both in Act 8 and overall. Kiwi wildcard crew RNZYS Lautrec Racing just pipped Visit Madeira into sixth with home crew Team Australia rounding off the leaderboard in eighth. Act 8 marked the end of a momentous year for the Extreme Sailing Series as it celebrated its tenth year with a change from the Extreme 40 boat to the super-fast GC32 foiling catamaran. With it came a new skill for the sailors to master, plus incredible boat speeds of up to 39 knots around the Series' trademark stadium racecourses providing a spectacle for crowds the world over. "Foiling has really added a new dimension to the sport," said Extreme Sailing Series Event Director Andy Tourell. "I don't think we could have had a better year - it's been absolutely sensational." The final Act of 2016 also marks the end of Race Director Phil Lawrence's six years at the helm of the Extreme Sailing Series, during which time he has been instrumental in shaping it into the world's premier short-course global racing series. Lawrence, who is joining the Volvo Ocean Race, bows out after delivering one of the most exhilarating Acts of the 2016 season in Sydney. The 2017 Extreme Sailing Series will kick off under the expert guidance of new race director John Craig with the season opener in Muscat, Oman, from March 8 to 11. Arnaud Psarofaghis, Alinghi: "We had a bad regatta in Cardiff, I didn't sail well at all. I made some bad decisions but after then we started from the beginning again. I learned that I needed to be patient sometimes and not to put pressure on the team. I realised I just had to sit at the back and concentrate on steering, and the crew would do a fantastic job doing the rest. The GC32s are perfect. At the beginning of the season we thought it would be hard to compete on small courses in foiling boats but now the Extreme Sailing Series is even better than before." Morgan Larson, Oman Air: "We started out really well and were a step ahead but everyone caught up. We didn't make that next step, and that's what we need to do if we're going to come back stronger next season. These boats are a challenge to race and the game gets tougher every day. We just didn't execute the middle to the end of the season properly and that really put us under pressure in Sydney." Roman Hagara, Red Bull Sailing Team: "We were always hanging in there with Oman Air and Alinghi but especially in the stronger breeze Alinghi had an edge on the whole fleet so it was tough to beat them. We tried hard. Yesterday we came quite close but the boat handling is really important in these boats and today we struggled a bit - so it's some little points but in the end the result is good." Jes Gram-Hansen, SAP Extreme Sailing Team: "It was fantastic day for us, we sailed the best we have all season. We're delighted. It's been a difficult season for us but all the time we've believed we could mix it up with the best teams and here in Sydney we've proved that. To finish second is amazing. We just kept pushing, talking to one another about everything, and we kept the faith in ourselves. We're already looking forward to next year – we're sure we can fight for the podium. The boats have been fantastic. The GC32s have been amazing for the circuit and I think all the teams have had a fantastic season." Neil Hunter, Land Rover BAR Academy: "Obviously at the start of the year we had a couple of senior team members onboard, we put in some pretty decent results, a podium in Muscat, Oman and a fourth place in China. Then we went to the full Academy team in Cardiff and obviously we had a lot on, being the youngest team in the fleet, but we've developed massively as a team over the last few events and we're at the point where we're winning races. I think this event has been outstanding for us and we're really showing that we're developing well as a team and we're putting in some decent results." Sean Langman, Team Australia: "Here we are at the end of the event, we've learnt a lot, we've managed to squeeze one third place in today which was pretty exciting for our team and all the rest of the races we were actually fully racing today so we know we're getting better but there's just a lot of refinement to come. As the pressure grows and you're starting to race then all the little mistakes start slipping in so then you slip back again but we're looking forward to the challenge ahead of us now, we've just got to sort out how we get a boat and how we get ourselves on the circuit." Chris Steele, RNZYS Lautrec Racing: "I think we certainly improved from almost survival mode on day one to fighting and getting competitive yesterday and then another step further today being able to get a race win and a couple of podiums as well. Awesome effort from all the guys and we're just really thankful to OC Sport for the opportunity to come and compete in the last stage of the 2016 season and a big thanks to everyone that's helped out with getting us over here. Lautrec, mainly for the funding, also Royal New Zealand Yacht Squadron, without those guys it would be pretty hard to be competitive and also thanks to the full crew, I think everyone played a big part in getting us around the track. It was just an awesome fun week and we're really happy to be able to come over here and hopefully it's not the last time." 1st Alinghi (SUI) Arnaud Psarofaghis, Nicolas Charbonnier, Timothé Lapauw, Nils Frei, Yves Detrey 238 points. 2nd SAP Extreme Sailing Team (DEN) Jes Gram-Hansen, Rasmus Køstner, Mads Emil Stephensen, Pierluigi De Felice, Renato Conde 226 points. 3rd Oman Air (OMA) Morgan Larson, Pete Greenhalgh, James Wierzbowski, Ed Smyth, Nasser Al Mashari 215 points. 4th Red Bull Sailing Team (AUT) Roman Hagara, Hans Peter Steinacher, Stewart Dodson, Adam Piggott, Brad Farrand 215 points. 5th Land Rover BAR Academy (GBR) Neil Hunter, Chris Taylor, Will Alloway, Sam Batten, Adam Kay 193 points. 6th RNZYS Lautrec Racing (NZL) Chris Steele, Graeme Sutherland, Luca Hyatt Brown, Harry Hull, Logan Dunning Beck 178 points. 7th Visit Madeira (POR) Diogo Cayolla, Frederico Mello, Gilberto Conde, Luís Brito, Tom Buggy 177 points. 8th Team Australia (AUS) Sean Langman, Seve Jarvin, Marcus Ashley-Jones, Gerard Smith, Rhys Mara 132 points. 1st Alinghi (SUI) 101 points. 6th Visit Madeira (POR) 63 points.